Jack El-Hai’s latest book, “The Nazi and the Psychiatrist,” tells one of the lesser-known stories of post-World War 2: the psychological analysis of the infamous Nuremberg Trial defendants. It is a fascinating journey. The book follows Dr. Douglas M. Kelley, a celebrated Army psychiatrist. As a Captain serving in the European theater, he developed techniques that greatly slashed the detrimental effects of combat fatigue, enabling soldiers to return to their units mentally healthy and able to resume fighting. Always an intellectually curious man, Dr. Kelley was overjoyed to be reassigned to work with the surviving Nazi leaders. Kelley served as a regular physician as needed, but his specialty was analyzing the psychological fitness of these prisoners. Of particular interest to Kelley was Hermann Göring, Hitler’s Reichsmarschall and choice to take over Germany after his death. Dr. Kelley performed the psychological evaluations as required, but he went one step further. Under the guise of administering routine tests, Kelley dug deeper into his Nazi “patients,” trying to discover if there was some trait, some gene, some sort of special indicator that facilitated these men becoming Nazis. His findings may surprise you. So painstakingly thorough was his methodology, that much of Dr. Kelley’s research is still being analyzed over 60 years later. During his tenure at Nuremberg, Dr. Kelley developed close professional relationships with some of history’s most-feared men. The sheer normalcy, even collegiality, with which Kelley and Göring interacted was especially unexpected: the guy who created the Luftwaffe could be charming, intelligent, and even funny. Naturally, most of “The Nazi and the Psychiatrist” focuses on this period in Dr. Kelley’s life. However, he was definitely not an ordinary Army doctor. Kelley came from an intellectually driven background, where mental discipline and broad curiosity were taught from a young age. After he left the Army, Kelley took a while to find his bearings, eventually settling at his alma mater, UC Berkeley, where he was the star professor in the school’s new criminology program. In addition to teaching, Kelley served as a consultant to numerous law enforcement agencies, TV shows, even Hollywood movies. As his professional life became more hectic, life at home with his wife and three kids began to suffer. And we are left to wonder if there might be a touch of psychosis in the psychiatrist. “The Nazi and the Psychiatrist” is a fascinating book—with a promising title like that, how could it not be? One risk with historical treatises is that the author sometimes over-reaches, padding what could be an interesting story with endless, dry recitation of facts. Happily, “The Nazi and the Psychiatrist” avoids this pitfall beautifully. Author Jack El-Hai presents plenty of information; indeed, I came away with a new understanding of both behavioral psychology and psychiatry, as well as the Nuremberg Trials. What El-Hai does so well is keep the story moving. No single part of the story bogs down in minutiae. He presents all manner of salient facts and details, but he does a wonderful job editing. 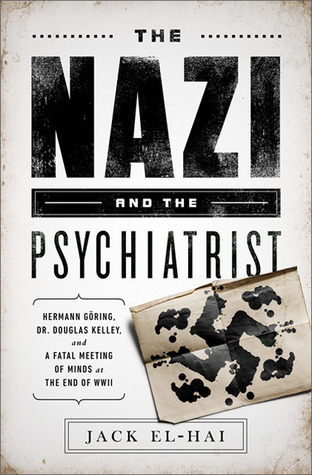 As the title suggests, at the core is the relationship between a Nazi (Göring) and psychiatrist Kelley. The pre-War and post-War life of Dr. Douglas Kelley bookends his Nuremberg experiences, and this information is crucial. Also, we go inside the Nuremberg Trials, even after Dr. Kelley had returned stateside. This, too, is critical. The resulting book is a gripping, informative, oddly bittersweet account of two men, and how their extraordinary lives came tangent to one another for a brief moment in time. It is most definitely a story worth reading. That it’s true makes it all the more compelling. This entry was posted in Books, History, Non Fiction and/or Commentary. Bookmark the permalink.